The first-ever 3D virtual reconstruction of the rib cage of the most complete Neanderthal skeleton unearthed to date may shed new light on how ancient humans moved and breathed. Researchers focused on the thorax—the area of the body that contains the rib cage and upper spine, which forms a cavity to house the heart and lungs. The conclusions point to what may have been an upright individual with greater lung capacity and a straighter spine than today’s modern human. “The shape of the thorax is key to understanding how Neanderthals moved in their environment because it informs us about their breathing and balance,” says Asier Gomez-Olivencia, a fellow at the University of the Basque Country and lead author of the paper, which appears in Nature Communications. And how Neanderthals moved would have had a direct impact on their ability to survive on the resources available to them, says corresponding author Patricia Kramer, professor in the anthropology department at the University of Washington. Neanderthals are a type of human that emerged about 400,000 years ago, living mostly in what is today Western Europe to Central Asia. They were hunter-gatherers who, in some areas, lived in caves and weathered several glacial periods before going extinct about 40,000 years ago. Studies in recent years have suggested that Neanderthals and early Homo sapiens interbred, because evidence of Neanderthal DNA has turned up in many populations. Over the past 150 years, Neanderthal remains have been found at many sites in Europe, Asia, and the Middle East. 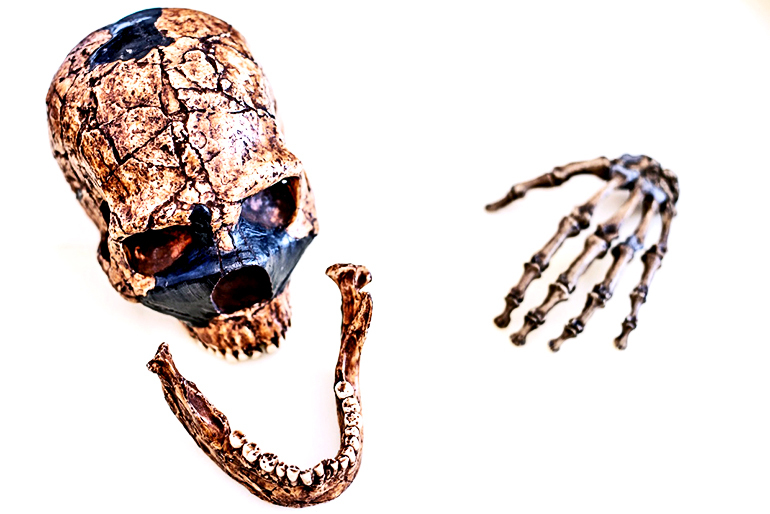 For the current study, researchers worked with a skeleton labeled Kebara 2, also known as “Moshe,” which was found in Kebara Cave in Northern Israel’s Carmel mountain range in 1983. Though the cranium is missing, scientists consider the remains of the young adult male one of the most complete Neanderthal skeleton ever found. Two different forms of dating of the surrounding soil, thermoluminescence and electron spin resonance, put the age at somewhere between 59,000 and 64,000 years. Discoveries and studies of other Neanderthal remains in the 19th and early 20th centuries gave rise to theories and images of a stereotypical, hunched-over caveman. Over time, further research clarified scientific understanding of many Neanderthal traits, but some debate has lingered over the structure of the thorax, the capacity of the lungs and what conditions Neanderthals might have been able to adapt to, or not. Over the past decade, virtual reconstruction has become more commonplace in biological anthropology, Kramer explains. The approach is useful with fossils such as the thorax, where fragile bones make physical reconstruction difficult and risky. Nearly two years ago, the same research team created a virtual reconstruction of the Kebara 2 spine, the first step in updating theories of Neanderthal biomechanics. The team’s 2017 paper, reaffirmed the likelihood of upright posture but pointed to a straighter spine than that of modern humans. For this model of the thorax, researchers used both direct observations of the Kebara 2 skeleton, which Tel Aviv University currently houses, and medical CT scans of vertebrae, ribs, and pelvic bones, along with 3D software designed for scientific use. They then used a technique called morphometric analysis to compare the images of Neanderthal bones with medical scans of bones from present-day adult men. “In the reconstruction process, it was necessary to virtually ‘cut’ and realign some of the parts that showed deformation, and mirror-image some of those that were not so well-preserved in order to get a complete thorax,” says Gomez-Olivencia. The reconstruction of the thorax, coupled with the team’s earlier finding, shows ribs that connect to the spine in an inward direction, forcing the chest cavity outward and allowing the spine to tilt slightly back, with little of the lumbar curve that is part of the modern human skeletal structure. “The differences between a Neanderthal and modern human thorax are striking,” says Markus Bastir, senior research scientist at the Laboratory of Virtual Anthropology at the National Museum of Natural History in Spain. This shape of the rib cage suggests a larger diaphragm and thus, greater lung capacity. “The wide lower thorax of Neanderthals and the horizontal orientation of the ribs suggest that Neanderthals relied more on their diaphragm for breathing,” says senior author Ella Been of Ono Academic College. “Modern humans, on the other hand, rely both on the diaphragm and on the expansion of the rib cage for breathing. Here we see how new technologies in the study of fossil remains is providing new information to understand extinct species,” Been says. What that means for how Kebara 2 lived is ripe for further research, Kramer says. How did Neanderthals breathe, and for what physical demands might they have needed powerful lungs? What does that tell us about how they moved and the environment in which they lived? Did any of these physical traits make them more or less adaptive to climate change? Reconstructing the thorax was an exercise in starting from scratch, deliberately trying to avoid the influence of past theories on the way Neanderthals looked or how they lived, Kramer says. Additional coauthors are from the National Museum of Natural History.